The Pendulum & Cart System consists of a pole mounted on a cart in such a way that the pole can swing freely only in the vertical plane. The cart is driven by a DC motor. To swing and to balance the pole the cart is pushed back and forth on a rail of limited length. 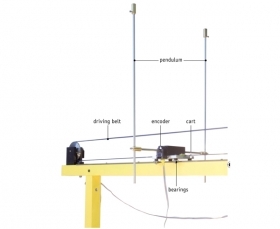 The purpose of the inverted pendulum control algorithm is to apply a sequence of forces of constrained magnitude to the cart such that the pole starts to swing with an increasing amplitude and it does not override the ends of the rail. The pole is swung up to achieve a vicinity of its upright position. Once this has been accomplished, the controller is maintaining the pole vertical position and is bringing the cart back to the centre of the rail. The system operates directly in the MATLAB/Simulink environment. The user obtains ready pre-programmed experiments in the real-time using the RTWT toolbox. He also generates his own controller in a very fast and easy way using Simulink and library of drivers. The forth order, nonlinear and unstable mathematical model of the system is included.